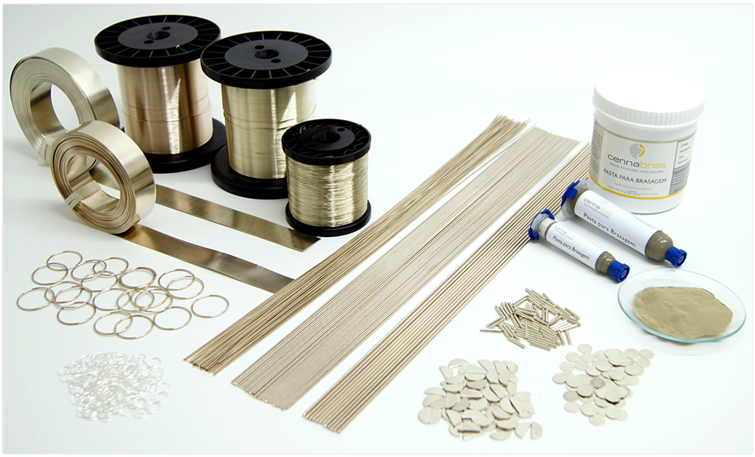 Cennabras has a broad range of cadmium bearing filler metals that have been developed based on International Standards. These filler metals are a great combination of melting point, flowing and mechanical characteristics. Lower brazing temperatures than cadmium-free alloys. Great flow and mechanical characteristics. Lower silver content when comparing to equivalent cadmium-free alloys. Copper and copper alloys including: brasses, bronzes, copper nickel, silver nickel and aluminum bronze. When brazing with cadmium bearing alloys, considerations have to be taken into account regarding personnel´s health and safety. Cadmium fumes are hazardous and equipment is necessary to efficiently extract these during the brazing operation. Cadmium bearing alloys should not be used in the manufacture of food/drinks handling equipment as well as medical/dental instruments. In such cases, cadmium free alloys should be used – please refer to Cennabras cadmium-free silver alloys. * Tensile/shear strength data refers to the application on Steel SAE 1020. ** Recommended gap is at brazing temperature and for air brazing processes. For furnace brazing or further details, please contact Cennabras. *** Other forms can be manufactured upon request. Please contact Cennabras for further information. **** Prior Reference: standard DIN EN 1044. This specification is not covered by DIN EN ISO 17672 (2010).